A group of thieves reunites five years after a failed heist in search of answers. From Trust, Greed, Bullets and Bourbon’s unsubtle title, to imdb’s basic synopsis of the film - "A group of thieves reunite five years after a failed heist to determine what went wrong and who is to blameas they attempt to recover the missing loot" - I have to admit, hopes were low for this scantily budgeted crime thriller. Another month, another Reservoir Dogs rip-off, was the jaded assumption. However, like the double crossing mooks that populate this twisty and tantalising urban drama, my instinct was not to be trusted, as Trust, Greed, Bullets and Bourbon delivers the loot. The basic premise is similar to Reservoir Dogs, in that the main plot of this film follows a botched heist and its heated debriefing. However Trust, Greed, Bullets and Bourbon’s narrative occurs years after the job-gone-wrong, and while Dogs’ Mr Pink, Mr Brown et al are virtual strangers, the characters in Trust, Greed, Bullets and Bourbon are old cronies, their lives complexly intertwined. Love triangles, childhood bonds and familial ties further muddy the already dirty waters between the crew, making for some treacherous sailing. Trust, Greed, Bullets and Bourbon’s accomplishments lie in the script’s prioritising of character and the detailed, convincing acting that realises this emphasis. In the focus on recriminations, betrayed trust and bitter reminiscence, something like The Big Chill would be a more apt reference point for the movie; another film in which secrets and lies are carefully and painfully peeled back by an ensemble cast. MVP goes to lead Larisa Polonsky; a Lana Del Rey-a like who shares the singer’s smoky, femme fatale persona, but also, thankfully, showcases far more of an emotional range than her chanteuse lookalike; her mercurial magnetism manipulating and slyly motivating the rest of the crew. Ace character actor Max Casella is hysterical as Tyler, bringing the manic oomph and profanity of an early Joe Pesci to his role as the crew’s wild card. Casella rides the screenplay’s crackling energy and shuffling layers with sleazy ease, chewing the scenery like a glutton. As you might expect from the film’s low budget (filmed in 10 days, according to the website), the action takes place in a few select locations. However, Trust, Greed, Bullets and Bourbon makes the most of its resources; its filmmaking and cinematography is as smooth and deadly as newly minted artillery. There is a superbly realised rapid fire opening sequence that introduces us to each crew member, and the eventual revelatory flashback is shot through with wit and innovation (as a certain character relays their version of events, another will step into the scene to correct them, the sort of visual tricksiness that works so well in offbeat cinema when done right, but so often isn’t). If absolute authenticity in crime movies is your thing, then manage your expectations, as, despite the cast’s manifest charm and talents, their fresh faces do lack the convincingly world-weary mien of career criminals. And whilst the film’s taut, drunken energy is mainly consistent throughout the film, there is a slight wobble in pacing towards the end (although, the visual gag before the final credits is very neat). 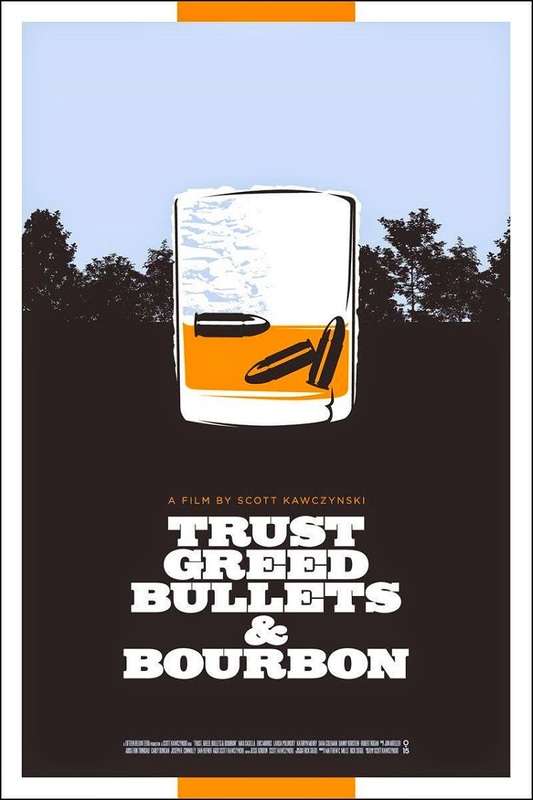 Overall, however, Trust, Greed, Bullets and Bourbon is a joy: a short, sharp whiskey shot of a film.